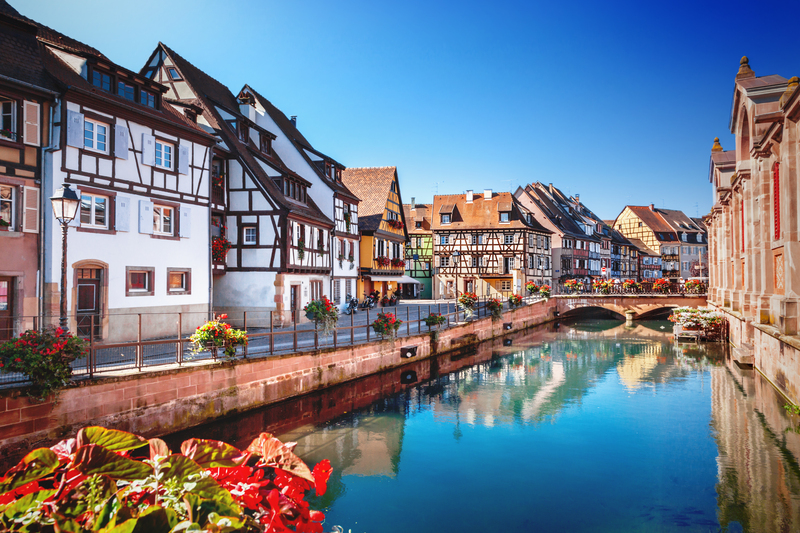 The history of France is shown to us by means of the many architectural styles that fill their cities and rural towns. Traditional French architecture might be better known for buildings like the Palace of Versailles and the many châteaux across the country. But the true force behind those magnificent buildings lies with the people who worked hard to provide materials and sustenance so these great projects were possible. And these people had their own architecture, being half-timbered houses one of many examples. 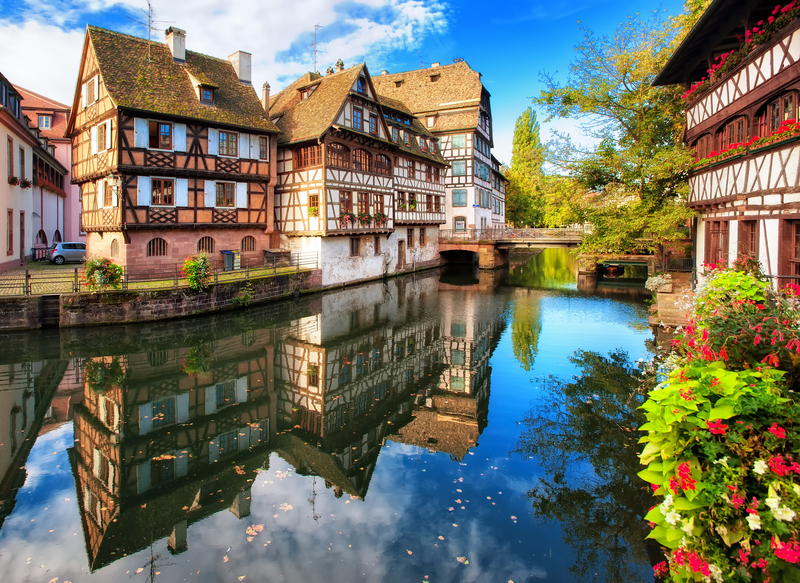 Half-timbered houses were built in France since late 15th century to early 19th century. These are more than three hundred years of tradition, so this is clearly a significant chapter of French architectural history. 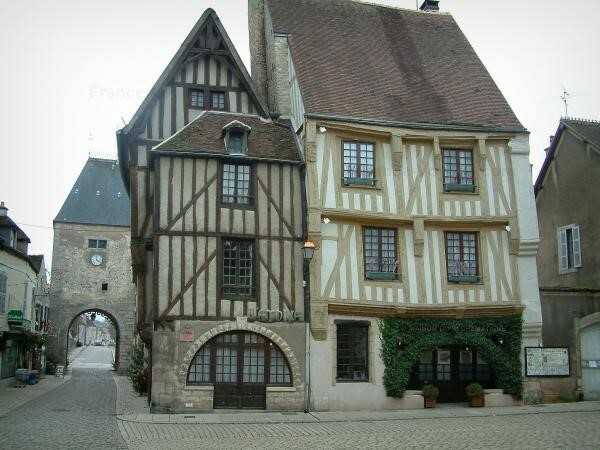 These houses cannot be found in every corner of France. As any other traditional building, it was built where the right materials could be easily found. These houses were common throughout the north-eastern part of France, and the style barely reached the center region of the country. Wood was incredibly abundant and the construction of dozens or even hundreds of these houses wouldn’t cause a great impact on the forests of the region. People back then built entire villages and cities using this material, and many of these houses are still inhabited today. This type of house does not exclusively belong to the traditional French architecture. It can be found also in Germany too, for example. But the inhabitants of each region would add their own variations to the basic scheme. This depended greatly on the availability of materials. In the case of the French half-timbered house, stone was not as common in north-eastern France as it was in regions like the Pyrenees. In consequence, houses couldn’t be made entirely of stone. But it was used in some cases nevertheless, as a base for the wooden frames. It also protected the wooden structure from humidity and any potential fires. Some would build a small stone base (40 inches high, or less), while others would use stone to build the entire ground floor, using wood to build the rest of the house. Standard construction rules didn’t exist at the time – at least not as we know them today. So each family could basically make such decisions without major consequences. 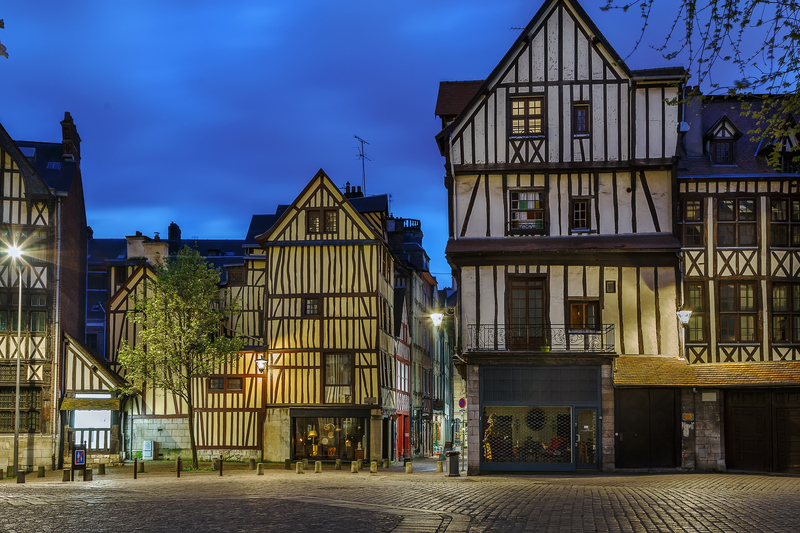 Street in the historical center of Rouen with half-timbered houses, France. 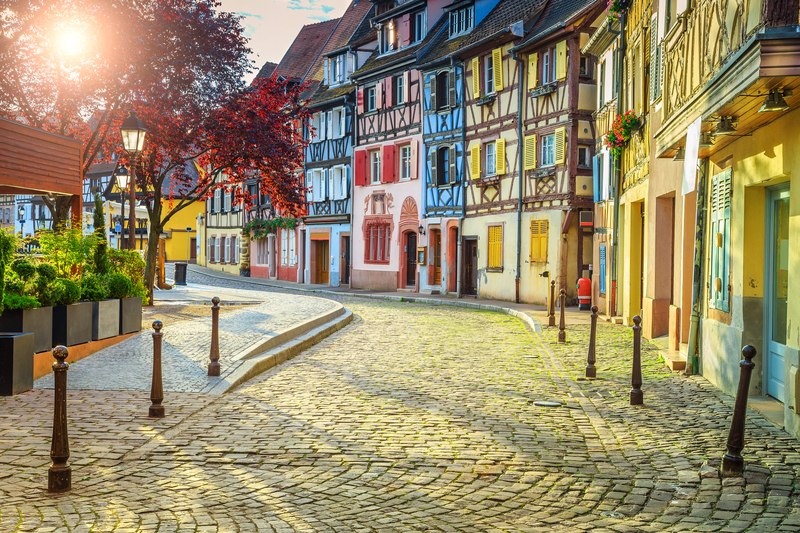 French half-timbered houses are resistant and their structure is flexible. But it takes only a small look to know that there’s not a major concern about the appearance of the structure. In other words, it’s common to see mismatched panels when we pay attention to the structural patterns of the houses. And this occurs even when the effort to build a regular structure is quite obvious. There’s a logical explanation behind this fact. People would try to obtain logs of similar length to build, but it wasn’t possible to achieve this every time. Frequently, a log would be some inches shorter than others, and there was nothing to do about it. It’s important to remember that there weren’t any factories that could deliver a complete load of wooden beams of the exact same dimensions. Basically, people did what they could, in the best way they could do it. So when this happened and the risk of building a weak structure was too great to ignore, they would add an extra wooden piece to ensure the stability of the whole structure. Would this make it look like a perfect aporticated system? No. But it didn’t need to look perfect, but to resist time and the forces of nature. Once the structure was erected, the panels (the empty space between one wooden piece and another) were filled with a variety of materials. Some were filled with cob, others with small stones or bricks. It was common to find walls of the same house made of different materials. It was also common to find panels filled or covered with a mix named torchis. This was made of lime, chopped straw, sand, and clay. It was impermeable, which was advantageous; and it provided decent isolation from the elements. This was another reason why the appearance of the structure wasn’t the most important thing to be considered. No family of the 17th century would be proud to live in a half-timbered house that looked unattractive with all those materials being randomly used in each panel. To avoid this, people would cover the walls with shingles. These could be made of wood or slate and would cover the outer walls entirely. They could also use roughcast, which was a combination of cement, gravel, and lime. These outer elements cannot be seen today in half-timbered houses. Time has proven a greater force. But the wooden structure has endured, and now it’s no longer a shame to let people see it. In fact, a completely exposed structure gives the houses their characteristic charm. What was to be hidden before, now is one of the greatest assets of the many touristic towns in north-eastern France popular among those interested in the tradional French architecture. 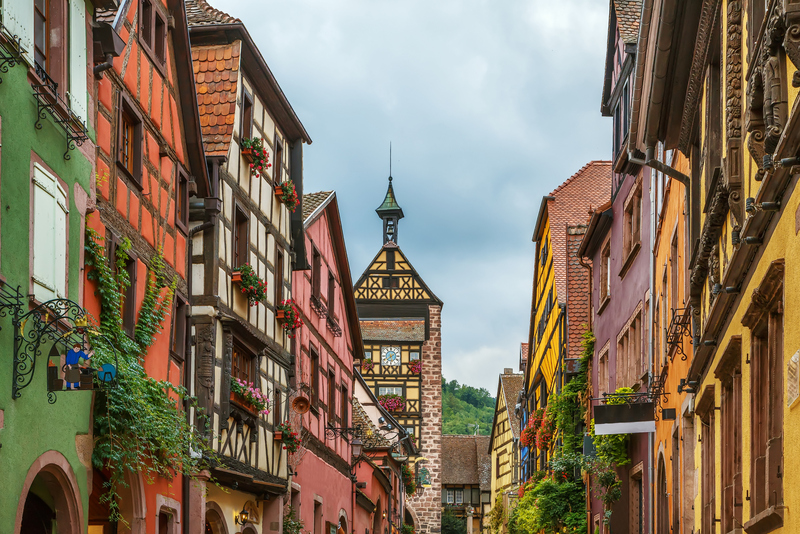 Nowadays, these traditional houses are part of the touristic charm of regions like Burgundy, Champagne, Normandy, and Alsace. Some of them are still family homes, although most of them are now being used as hostals and B&Bs. Ground floors are now used as shops, while the first and second floors are used to accommodate guests or local families. Many of the new owners of these houses have decided to restore or paint the wooden structure, and of course, give a new appearance to the inner and outer walls. This makes them more attractive to the modern tourist, without disrespecting the legacy of traditional buildings. Some half-timbered houses are also for sale, so others can start a new life in north-east France, in a comfortable, simple and rustic house that takes them away from the city. For some, these are perfect retirement homes. For others, a romantic refuge for a weekend getaway. No matter their reasons, they all feel the same respect and fascination for this example of French architectural history.